THIS IS A FIRST STEP. Everything isnt included. There's a lot of stuff left out. Check out the links if you have questions about each topic. This thread explains what files Mugen, and the Characters use. Check it out if you dont know what any of the files do. You'll need the character.def file listed in your Select.def for mugen to even show your character. It links to the cmd file that allows you to change the character's states inside the cns file, that calls on the air file to show the sprites (images) of the character. the cns also calls on the snd file to play sounds. the Def file decides who your character is. The CNS tells mugen how that character acts. The CMD finds out when the character can perform moves. The start of your character's lists the Player's Variables at the top of the .cns file, lays down most of your character's traits. Just the basics. hits player 2; because it's a fighting game! Like if you wanted to make a projectile, or a move that makes other moves (a helper). All the controllers go under the statedef, and above the changestate. You dont have to have a changestate to end it, but most states do. In the CNS file there are two special statedefs, Statedef -2, and Statedef -3. Statedef -1 IS/is in the CMD file. Mugen constantly monitors these Statedefs without the character having to be in them. Would work best in Statedef -3 because if P2 throws you and uses stateno 106 the sound would play. Obviously this is something the other creator wouldnt want to happen. Be sure these are located before all -2 and -3 state coding. The CMD controls the controls. The input from the keyboard/controller is matched up to commands in the Command Definitions, then the State Entry kicks in. Command Definitions section has [Remap], [Defaults], and [Command]. There can be a maximum of 128 Command names. The State Entry, Statedef -1, part is usually where you see all of the ChangeStates and AI code. Commands can also be read as triggers which allows you to sneak in statedef -1 style changestates inside the CNS file. The name has to be inside the CMD file for it to work though. If youre having trouble making the commands work, there's a common mess up. As I mentioned, mugen is constantly searching statedef -1. It's also looking at button inputs to match against the command definitions. Because people arent super precise pressing buttons, Mugen gives us some leeway. While you may think you pressed F,D,DF, A, in reality you may have pressed, F,DF,D,DF,F, A. If you notice the first set of inputs is hidden inside the second set. 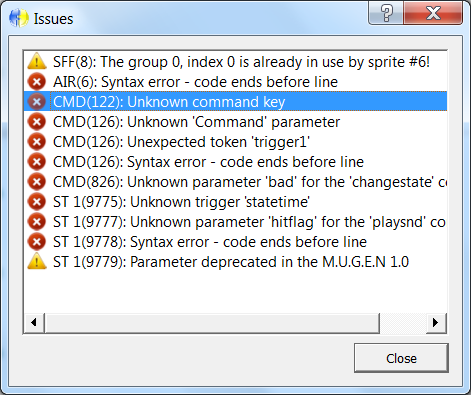 Mugen lets that activate the command which will go down the line to the changestate. If both sets are actually a named command, both will be triggered in the order their listed. Meaning if F,D,DF, A is above F,DF,D,DF,F, A. Mugen checks it first to see if any ChangeStates with that name can be activated. If not, Mugen will check if any Changestates F,DF,D,DF,F, A. can activate. The way to make sure you can do all of your moves properly is to make sure the most complex input commands are at the top Going a step further you'd need to make sure your most complex ChangeStates are at the top of the State Entry section. This isnt always the case but it's important and just good practice. This thread is a mess right now. I plan on editing this a lot. For now, I think I'll lock the topic until it's a little better. If you feel I should refine or talk about anything and it's still locked, shoot me a PM and I'll add it. This post will hopefully list some useful info if you're having trouble with your character(s). Your best bet if you're running into trouble is to use the search button and search ALL of Mugen Development Help. If you're having a specific problem with something, refer to The MUGEN Docs Master Thread. If your question isnt answered post a question in help. We've all been there. Cycling debug will go from Player to Player to Player... to Off. Once debug is off and is restarted it jumps back to P1. Remember Helpers also count as Players! So if you press Ctrl+D and it's on a helper you'll get the info for that helper. Debug posts the Anim, AnimElemno, Time, Animtime, and StateNo, and a bunch of other info. You can also get it to post almost anything else you'd like to know using DisplayToClipboard & AppendToClipboard. Helpers can also use Display and Appendtoclipboard. You just have to cycle debug until you reach the helper. If debug is active for the helper and it's destroyed, You'll see a message like "Player 4 Disabled". Debug will automatically work if the helper is recreated. If the Helper isnt active cycling debug will skip over it's spot and proceed to post about the next character. (or turn off) If the helper is destroyed and you move to the next player, and the helper is then recreated, you can cycle all the way back through and debug will post the info for the helper. ;Set to 0 to disable starting in debug mode by default. and set it to 1. This will help with 2 things. Having to turn it on every time you load up, and the fact that pressing ctrl+d skips the intro(s). Remember, if you need to debug the intro and you dont have debug on, F4 will reset the round and you'll see a random intro. Debug will also help you see the Flood. Debug flood will post if youre missing required sprites, if your using a float value in the wrong spot, and a few more things. VirtuallTek's Fighter Factory 3 will also list any syntax errors in the CNS file. It's very useful for finding problems and typos. You should really be using this tool if you're building characters. In my example you can see it lists, SFF, AIR, CMD, and ST. I'm not sure if SND file can have an error or if FF3 would detect it. 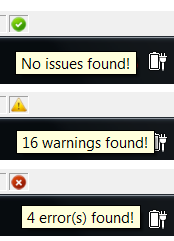 If you double click each line, FF3 will jump to the problem. More to come later as I think of it. Hmm, Isn´t here are now also that FF fusion or what it called?